Correctly press the up or down buttons at the door, not both at the same time. If you press the up or down button at the same time, it will make the elevator useless and waste the waiting time and electricity. When the elevator arrives, if there are multiple parallel elevators, the arrival lights of any one of them shine and the arrival bell rings, inviting you to wait at the entrance. After the elevator closes, passengers first go down and then go up. If any passengers come out of the car, you should stand on both sides to facilitate their evacuation and then enter the car. If the car is full, please wait patiently for the next elevator to arrive. In case of fire or other circumstances, people in the building shall evacuate through the stairway. Do not take the elevator, in case the power of the elevator is damaged, taking the elevator will be trapped in the car. Get in and out of the car quickly and safely, do not stay at the door. Passengers standing at the door should leave the car first. Press the destination floor button correctly to ensure you can reach the aim floor. If the number of passengers in the car is moderate, you can move deep into the car to facilitate other passengers. Passengers with children need to take good care of children, and passengers with pets should prevent pets from moving alone. Keep a distance from the elevator door. 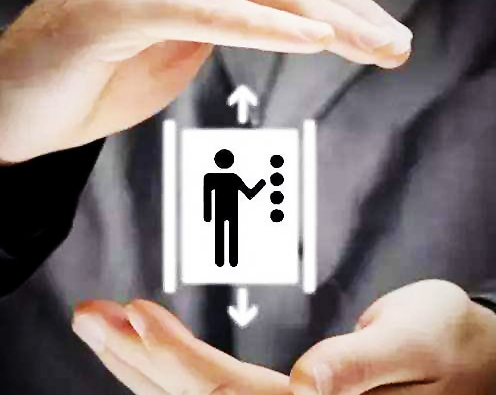 When open and close door, special attention should be paid to prevent clothing or personal belongings from being crowded by the elevator door. Pay attention to check the elevator on the presence of << safety inspection >> label, and whether in the period of validity, don’t blind to take elevator such as do not conform to the requirements of the elevator equipment, to reflect the local Special Equipment Safety Supervision Department. Stand as close as possible to the wall of the car and put your hands on the car arms if elevator with it. Most elevator injuries occur at the door or in the hoistway. When the elevator fails, stay away from these two positions can keep you safe. Attention should be paid to the handling of articles. For transparent objects such as glass, when entering or leaving the car wearing thin long skirts, high heels and carrying umbrellas, careful attention should be paid to the accident caused by clamping. Do not carry inflammable, explosive or corrosive dangerous goods in the elevator. Posted in Company News and tagged civilized waiting for the elevator, elevator button parts, elevator car, elevator safety knowledge, get in and out of the elevator car correctly, how to use the elevator safely, multiple parallel elevators, press the up or down buttons at the door.